Bad days. We all have them, right? Days when you wake up and you don’t feel your best and you’re not really sure why. Then… to top it off, you learn about a not-so-hot Yelp review a patient just posted about someone or something in your practice. These are all normal things I see in my work of helping healthcare practitioners maintain happy and healthy healing environments. Everyone has bad days. It’s part of the human condition, right? But… there is a way to help minimize those days, release negative energy in your space and get back to your (and everyone else’s) more joyful, happy self. It’s kind of simple, really. Space clearing is like physically cleaning a space except with space clearing you revitalize energies in a built space. Just like dust and dirt (and germs) accumulate in the physical space, “dust and dirt” of human emotions build in a space. The more patients and people who come and go into your practice, the more build-up of emotions in the space and the more important it is to clear out that build-up regularly. When you feel crappy and other crappy stuff is going on around you (in any space really) it’s a big sign you need to space clear. I recommend space clearing your work environment as part of your regular cleaning activities. There is so much value in regular space clearing. You (and everyone else) will instantly feel the difference it makes. Instead of feeling emotionally heavy, tired and slow at work or crappy and sad, you (and everyone else) will feel more uplifted, lighter, positive and optimistic. Regular space clearing is important in maintaining nurturing healthcare environments. Your patients will love the unexplained feeling of “It just feels so good in here” and I don’t know why. 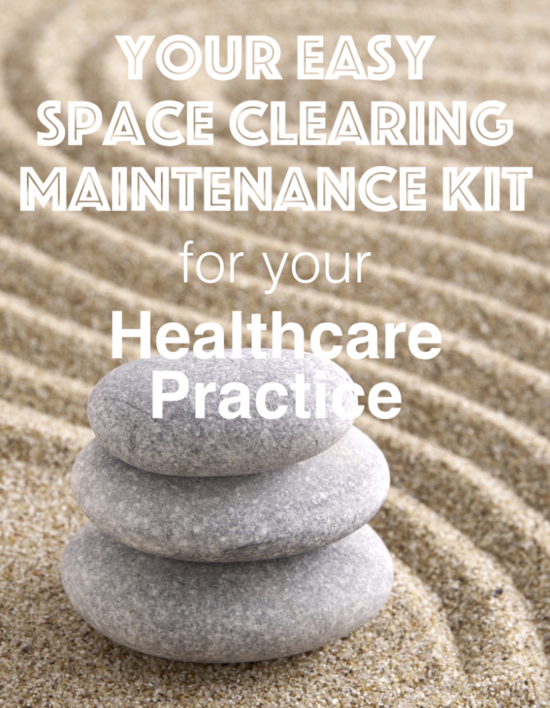 To make it really easy for you, I put together a super quick Easy Space Clearing Maintenance Kit For Your Healthcare Practice.